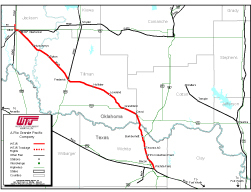 The Wichita, Tillman, & Jackson Railway Company (WTJR), is a 100-mile property composed of a former UPRR branch line operating in Texas and Oklahoma. The railroad interchanges with the UP and BNSF in Wichita Falls, Texas and Altus, Okla. Shipments are predominately grain, chemicals and agricultural products. Rio Grande Pacific Corporation maintains a 100% equity interest in this property.